It was a cold, windy night in Chicago when I landed. A marathon week of business travel had left me tired, and after four days in Vegas for three simultaneous conferences, I still had one more event to attend before I could head home to ATL. While I usually stay in decent hotels when I travel for business, this one would be an unusual treat: I was staying at the Four Seasons. When I walked into my room, it became immediately clear that no detail had been overlooked. Large windows with lush curtains framed the beauty of the nighttime Chicago skyline. A full-size umbrella hung in the closet, next to the shoe shine kit. A large bench awaited my suitcase, rather than one of those fold-up stands. And on the desk, there was one of the most beautiful flower arrangements I had seen. What a nice touch, I thought! As I opened the card that was tucked gently into the arrangement, I realized that they were not, in fact, from the hotel. My wonderful SO had sent them. I LOVE flowers, and few things are better than flowers for “no reason.” It wasn’t my birthday, or Valentine’s Day, or our anniversary. He missed me and knew I was having a long week. After gushing endlessly on the phone and admiring them as I finished some final prep, a thought crept into my mind: how can I take these home with me? I googled endlessly and couldn’t really find an answer. So 36 hours later, I decided to give it a try. I kept the water in the vase until I arrived at the airport, then I carefully poured out as much as I could. I sat them on the conveyer belt at security, all the while wondering if they would get damaged by the flaps on each end of the X-ray machine. I went through the people scanner and waited with baited breath as I saw them come up on the X-ray screen. The TSA agent paused and cocked his head. But the conveyer belt started moving again, and they emerged through the flaps on the other side. Another TSA agent came by, stuck a few fingers in the vase and then let them move on down the line. I scooped them up like my lost puppy had just come home. The flaps had messied the arrangement slightly, but they were in better condition than I expected. Then, it was onto the gate, with a quick stop for water to refill the vase. The closer I got to the gate, the more nervous I became. Do I ask for permission or just act like I’ve done this before? I generally live by the “ask for forgiveness rather than permission” rule, so I sat down and waited until they called my zone. When it was time to board, I walked up to the gate agent, boarding pass in one hand, flowers in the other. As she opened her mouth, I figured my flying flower crusade was finished. A sigh of relief overcame me. Once on the plane, I slid my flowers under the seat in front of me. The flowers made it from Chicago to Atlanta and donned my table for the next week. Just to make sure it wasn’t a fluke, I tried flying with flowers again last week. Following the same process (with the addition of putting them in a box to pass through security), and it worked. So, as it turns out, you CAN fly with flowers (at least on Delta). And that makes this flower-loving girl one happy traveler. 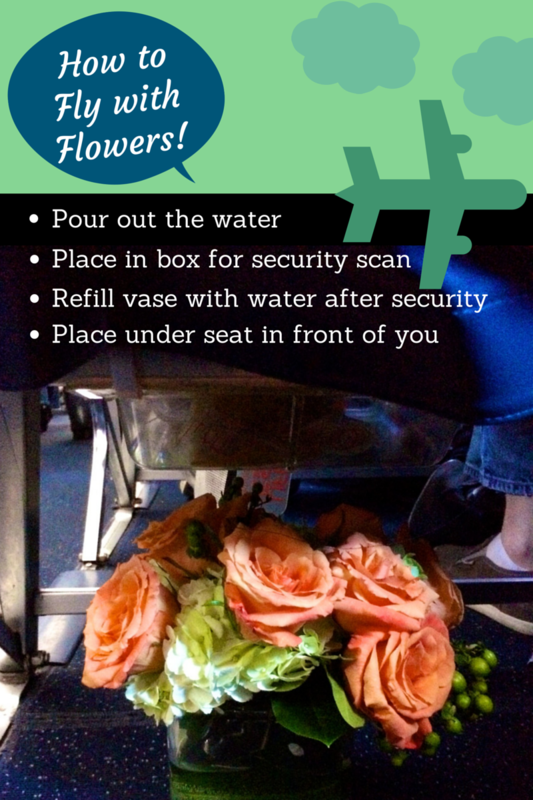 Quick tips to fly with fresh flower arrangements! Only try this with short flower arrangements. Pour out the water from the vase before you get to security. (no liquids are allowed that aren’t in 3.4 oz containers inside a quart-sized plastic bag). If you have a box you can put them in, do it (even if only to get them through the security scanner unharmed). Buy a bottle of water once you’re past security and refill the vase. Put them under the seat in front of you. If necessary, alert your seat mate to ensure that he/she won’t kick them. Voila! Enjoy your flowers for many more days!